My dad came to visit from Louisiana a few weeks before Thanksgiving. Sort of an early holiday visit, since John and I had decided to take a vacation with the kids during Thanksgiving week. This time, my dad wanted to get out of the house and “see the sights.” When he told me this, my mind started clicking in about a dozen different directions. 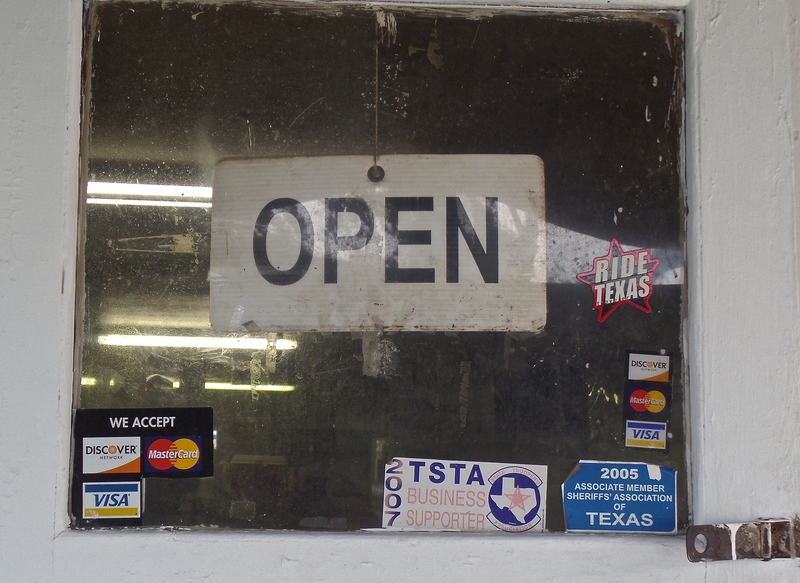 A lot of strategic planning is involved in showing my dad “the sights.” I figure it has to be something not too far from the house, something that is quintessential Texas, and, preferably for both of us, someplace where good eats are fairly close at hand. Why not Huntsville? Huntsville, about 50 miles north of Spring and The Woodlands, was the final home of Sam Houston, where today you can visit the Sam Houston Memorial Museum, located within the campus of his namesake university. The complex contains a museum proper, two of his actual homes, his law office (a log structure that is about as rustic as an office can get), and other authentic buildings, all on 18 acres of the actual 200-acre farm where he lived during his final years. Perfect! So we headed for Huntsville, up I-45. As we passed Conroe, the landscape became gently hilly and the pine trees thickened. 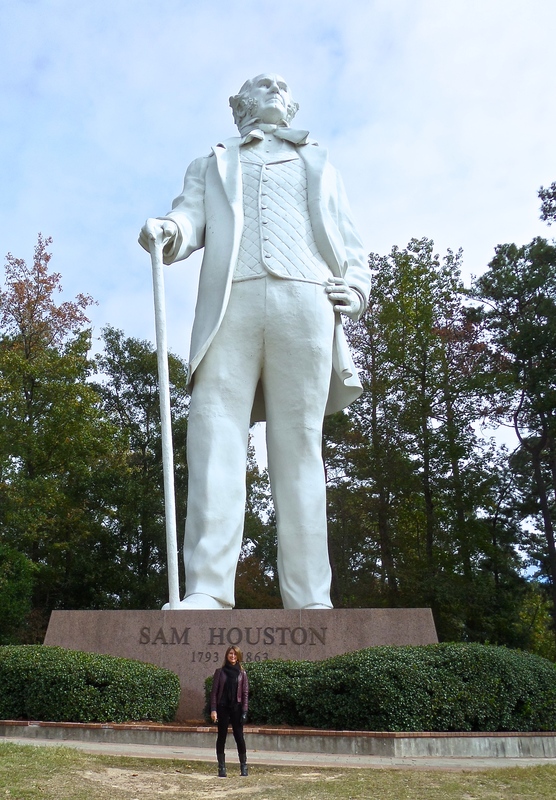 We u-turned on the Huntsville exit feeder to make a stop at the giant-size, kitschy statue of Ole Sam that stands guard over a stretch of I-45 just down the road from Huntsville State Prison. According to the City of Huntsville, the figure is an amazing 67 feet tall, the tallest statue of an American hero anywhere in the world. By now it was getting to be lunchtime, or time for “dinner,” as my dad calls it. 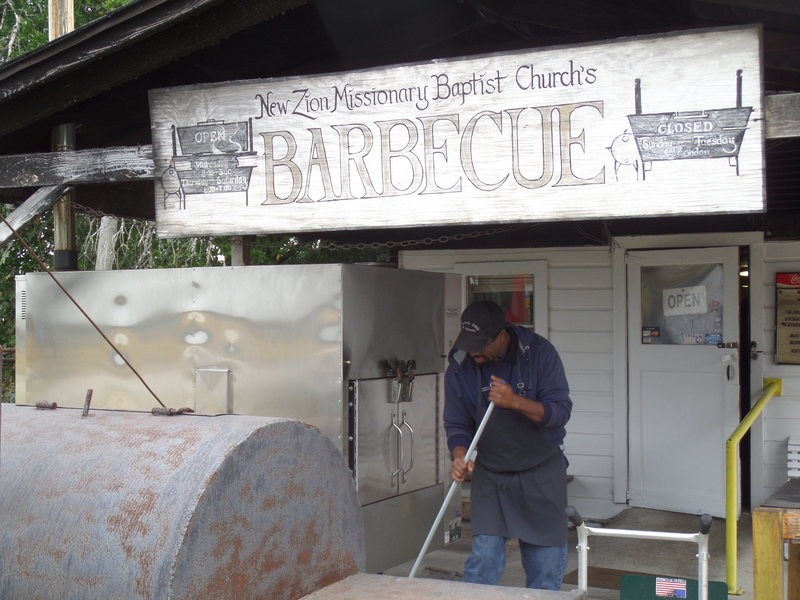 So to revive our spirits before we headed to the SHSU campus, we made a detour to the well-known New Zion Missionary Baptist Church BBQ. A humble little spot that sits right next to the church that runs it. The restaurant is not just any old place. 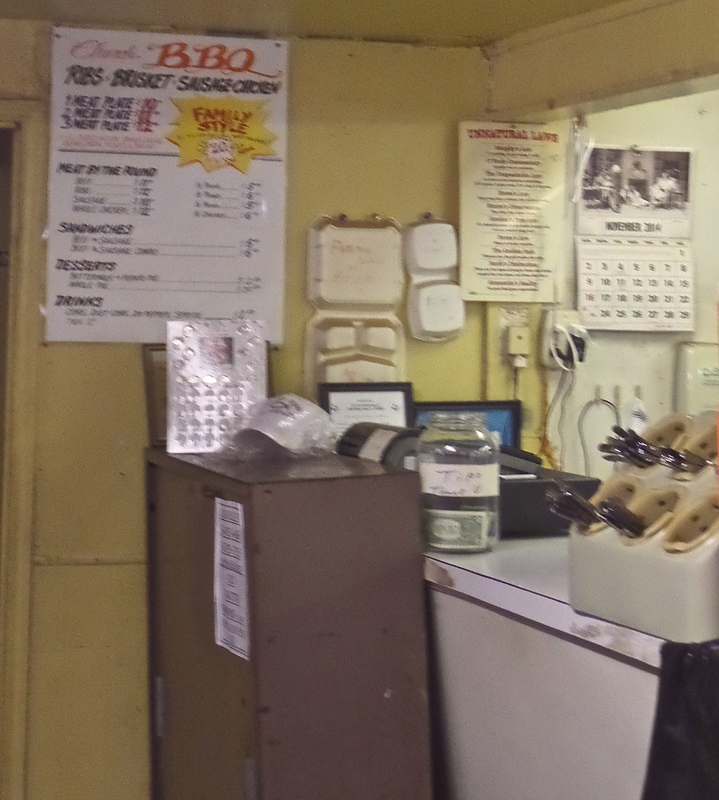 It’s a Huntsville institution that has been featured in Saveur and graced many-a top 10 list for best barbecue in past years. 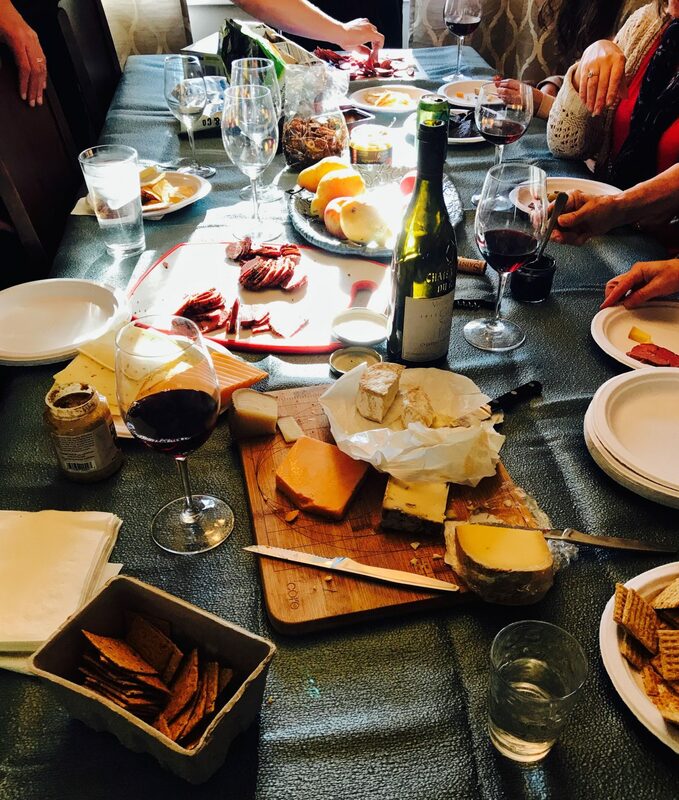 Eating here is like eating at your Great-Aunt Alma’s house, the one who can cook a meal for 25 people with her eyes closed and never sits down. She doesn’t have a lot to say, just keeps stirring the pots and bringing out the good food. We ordered brisket and pork ribs at the counter. 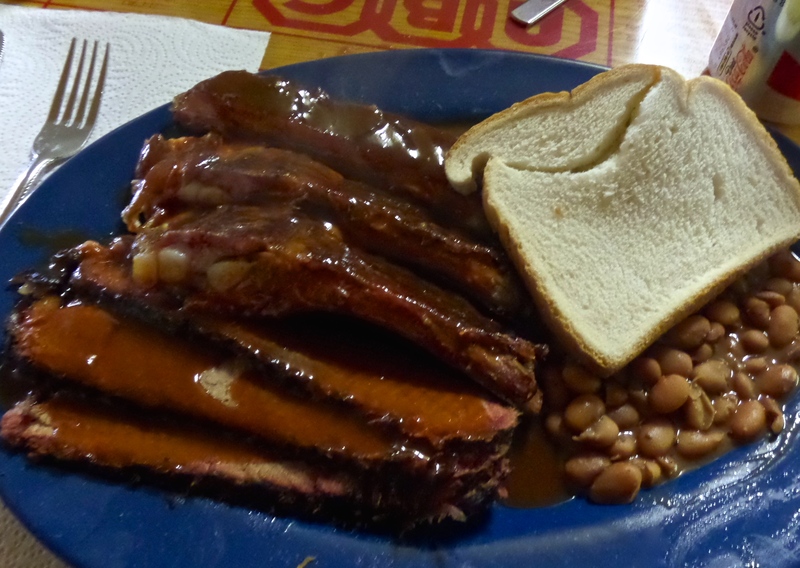 Unlike Central Texas barbecue, the meat was already sauced when it arrived at our table. 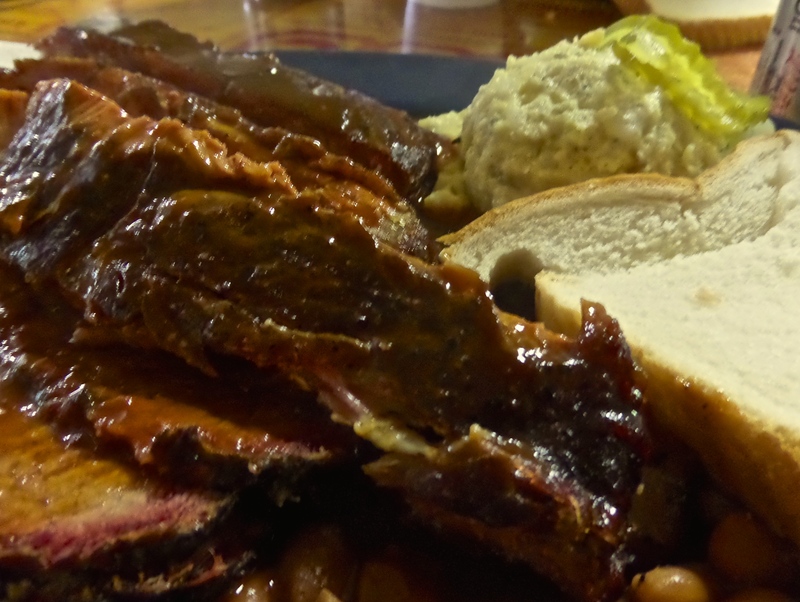 Each plate came with a serving of pinto beans, a mound of potato salad and a slice of white bread. Though I usually like to sample the meat sauce free, I didn’t mind the addition here. The sauce was better than most that I have had around Austin, warm and on the thin side, vinegary with just a hint of East Texas sweet. I would gladly return for another plate of ribs and sauce. I’m not a fan of most restaurant potato salad. But this one was mild and creamy, with just enough pickle relish, an affable partner for the tangy sauce and meats. We saved room for a little homemade buttermilk pie, but they were already out. Instead, we sampled the sweet potato. It was light and almost fluffy, with a hint of what tasted to be fresh lemon zest. 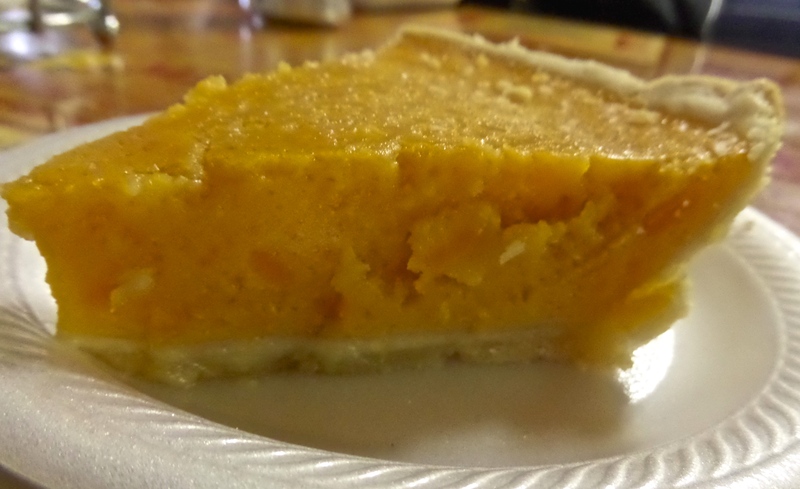 A slice of this would definitely make a pumpkin pie lover think twice. 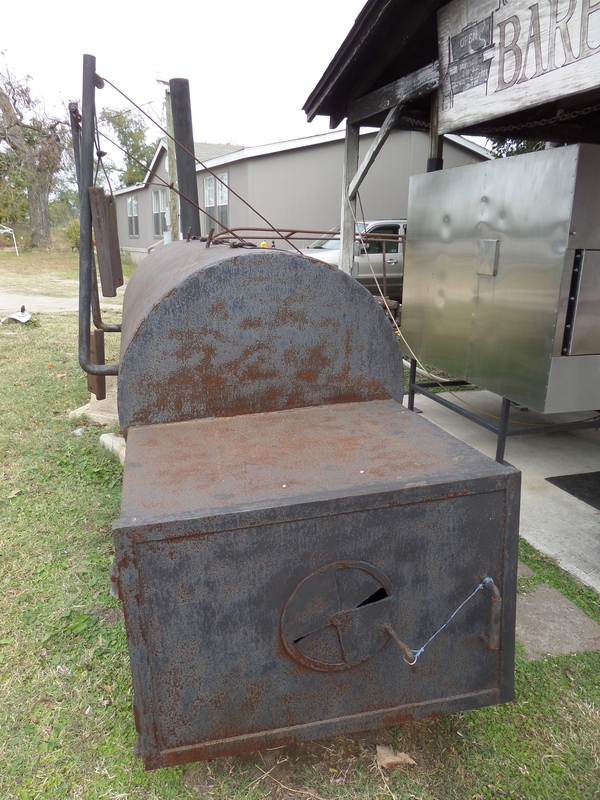 On the way out, we took a closer look at the two smokers–the old wood burning smoker and the newer, mainly gas smoker. I did not ask which was being used, or if both were used. The wood smoker was looking pretty forlorn. It’s hard to be a purist when it’s cold outside, the food tastes like home cooking, and so many locals are walking through the door, glad to be eating at this venerable standby, warm and comforting. Having had our fill, we headed for the campus museum complex. It’s a wonderful place to spend a few hours and learn about this very dynamic, eccentric and pivotal figure in the history of Texas, as it moved from colony to republic to statehood. My dad and I are both big history buffs, and we would have stayed there even longer if it weren’t so cold. 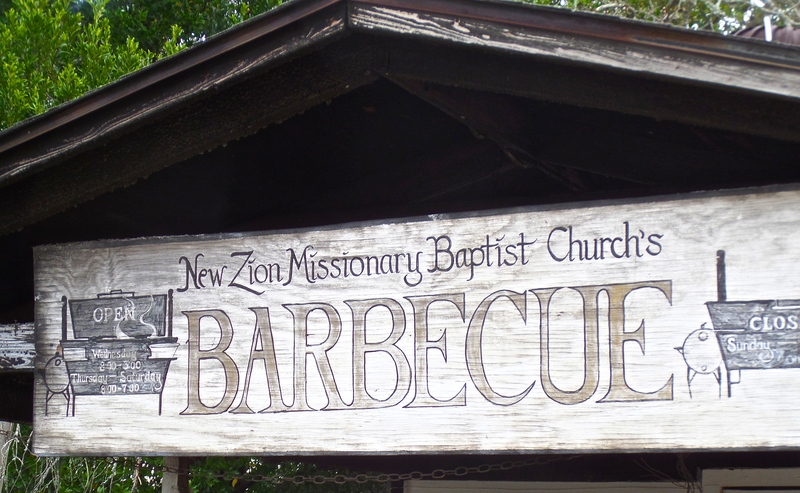 Barbecue and a little Texas history. I think Sam would approve.